Corrosive Contents: CC8: Strange Adds Involving Koala's. 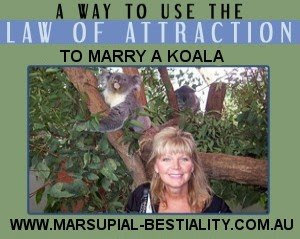 CC8: Strange Adds Involving Koala's. well she certainly hasn't got anything else going for her anyway! why shouldn't people marry animals, at the rate we are killing each other we might be left with no choice!!!! That's not a real website! You LIED!